Produktinformationen "One Piece - Portgas D. Ace HQS: Tsume"
Due to the high number of requests, and despite the impossibility of unveiling ACE HQS by Tsume in its entirety before January 2017, we have decided to open the preorders of Ace and leave them so until our LIVE of January. (However, we will limit at all time our production to 4000 pieces, which represent the maximum capacity of our factory). The unpainted prototype we had shown during the Tsume Fan Days 4 has undergone some modifications. The cross inside the fireball of Ace has been replaced by a whirling smoke. Some volumes have been reduced. In order to let you the opportunity to change your mind once the statue is unveiled, any preorder cancelled before the 1rst of February 2017 will be fully refunded. *********************************** After the outstanding statues we previously released on ONE PIECE, we are glad to introduce you to our interpretation of the legendary Ace. Our HQS by Tsume at the scale 1/7th shows him standing on the burning remains of the scaffold during the Marineford battle, freed from his granite shackles. The emphasis has been made on the wooden setting and the texture of his skin on which the surrounding flames are reflected. The statue is overhung by an impressive fireball that completes our staging. Finally, a programmable LED system makes it possible to give life to the blaze and immerse yourself in the confrontation that took place at the Marine HQ. Many elements have also been sculpted manually to increase the level of details. The painting level has been pushed even further, the complementarity between all our artists combined with new production methods enabling us to reach a new step in the making of figures. You will have the choice between two symboles to put on the base of Ace, either the one of Whitebeard or the one of the Spade. 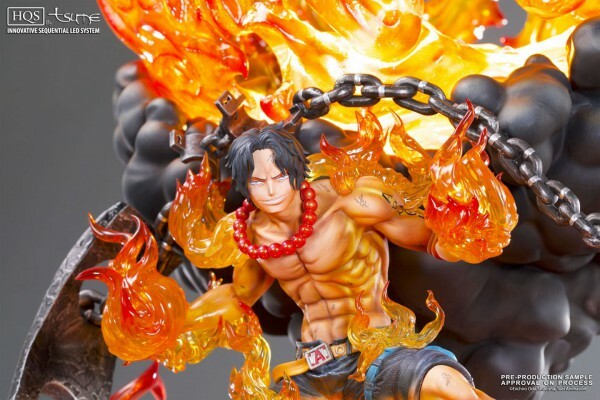 Weiterführende Links zu "One Piece - Portgas D. Ace HQS: Tsume"
Kundenbewertungen für "One Piece - Portgas D. Ace HQS: Tsume"